Despite the title, Yonta’s eyes aren’t blue, which leads to some confusion when she receives a poem eulogizing them. Yonta is a strikingly pretty teenager with interests typical of her post-independence generation: fashion, music, dancing, hanging out with friends. She has a crush on Vincente, a friend of her fathers, who gives her presents (like a ridiculous/awesome watch-belt) but remains blithely ignorant of her puppy love. Vincente is too busy trying to run his fish storage and distribution center. An intelligent and hardworking man, he hopes to ride his country's economic upsurge and take along his friends and community, largely fishers and hawkers, along with him. But his high ethical standards and low loan prospects, not to mention the city’s unreliable electricity, make running a profitable business harder than expected while his hybrid of Marxist and capitalist philosophies doesn’t earn him much gratitude from either employees or clients. In an excellent speech to Marcos, Yonta’s kid brother, he calls money the new weapon of African freedom, but his tone is tinged with ambivalence and regret. In his lonely personal life, we see him communing with carved idols in his otherwise modern apartment. Trade picks up for Vincente and he’s soon able to hire more staff, including a driver named Ze. Ze is a good-natured but overly-romantic night student who frequently stays up late reading under a streetlight. His resulting tendency to sleep late lost Ze his previous job, ill-suited manual labor on Bissau’s docks, where he once met a poet in love with a Swedish immigrant. Ze copies his poems, including the perplexing reference to blue eyes, in his unrequited suit for Yonta’s love, but he can’t even manage to get her attention. Meanwhile, always underfoot running errands and messages between the others, there’s Marcos, whose energy and enthusiasm are perhaps the most telling example of the film’s underlying optimism for the future. 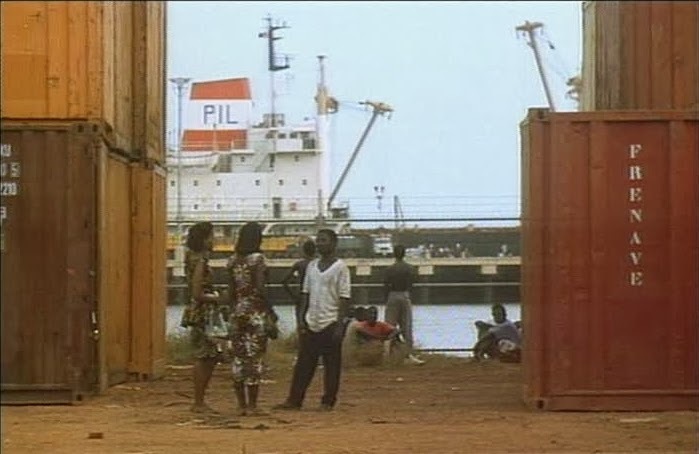 Guinea-Bissau’s first feature film director, Flora Gomes, deftly weaves together multiple perspectives from disparate generations, classes and genders to create a slice-of-life drama that’s hard to pin down. But that slipperiness actually is exactly what makes The Blue Eyes of Yonta a pleasantly rewarding and distinctly mature experience. 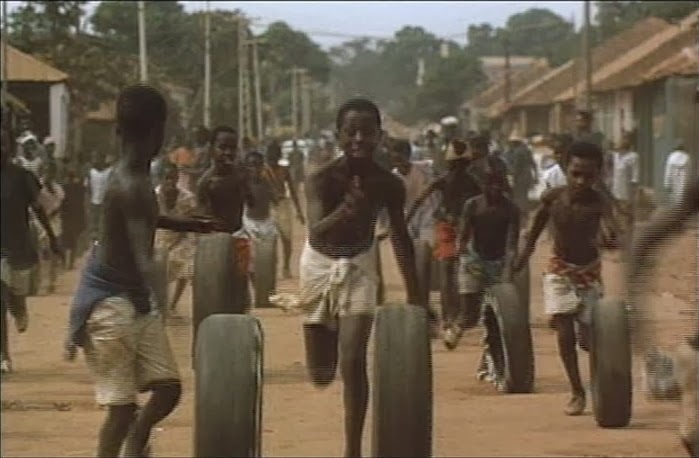 Instead of blanket statements or broad generalities, Gomes opts for a holistic approach to contemporary (early 1990s) Bissau that treats children, parents, students, workers, bosses, et al with a benevolent respect that refrains from judgment (though they often judge each other). But don’t mistake the lack of pushy agenda for apathy; Gomes may not claim to have the answers but he clearly wants us to think about the way modernization, capitalism, sovereignty, democracy, urbanization, westernization, dreams and disillusionment have reshaped his country, both for better and worse. Vincente, the most fascinatingly complicated of the characters, notes that progress has not been for everyone and is frustrated by reality falling short of his independence-born idealism. Yonta and Ze, both stymied by romantic rejection, mirror Vincente’s economic and cultural disappointment. 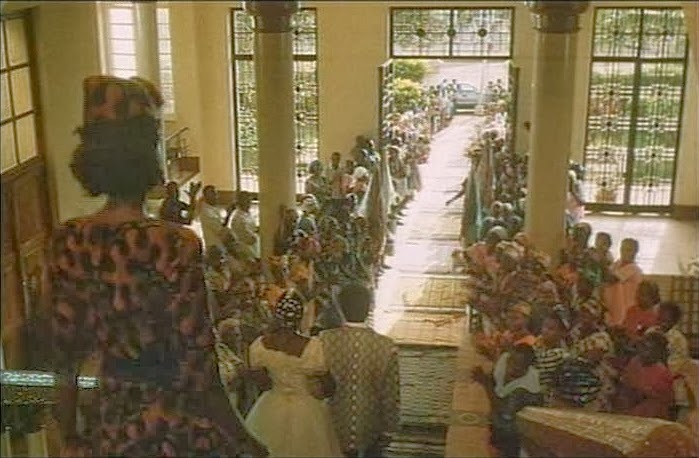 But for a film that culminates in so much disconnect and disgruntlement, the final shot of children dancing around the poolside ruins of a western-style wedding strikes a farcical rather than tragic chord.